Step 1: Choose one all-powerful figure to serve as artistic director for the year's family photos. Step 2: Artistic director decides on a color scheme and refuses to heed the complaints of others regarding said color scheme. In this case, cool, dark colors. Also, artistic director chooses a level of formality--this year, jeans for all! "You can't wear that--it's bright red!" "Dad, no, not a white shirt. Everyone is wearing dark shirts." "How am I supposed to wear jeans when I don't even have any jeans?" "Should I wear my pink sandals or my flip-flops? I don't have any other shoes!" "I feel like I look too casual." Step 3: Choose a time when everyone is available. This is extremely difficult when it means balancing multiple work and school schedules and everyone's social and educational commitments, but it can be done. Step 4: Find a photographer. I mean, there's always the tripod route, but actual hands make the job easier and give Dad a more natural smile. Ideally, your photographer friend is willing to work for ice cream. Step 5: Choose venue. Or have several brilliant ideas for picturesque venues, choose one based on a practical location, and keep in mind a rainy weather location just in case, because you'll not have another chance for family photos again before Christmas! Step 6: Day of, make sure hair and makeup is flawless. Don't forget details like...the camera. "Who's going to do my eyeliner?" "You're using too much hairspray! I can't breathe!!" "I'm serious, we're leaving in 10 minutes, whether or not your hair is done." "But nobody told me I was supposed to get the camera ready." Step 7: Smile, and never, ever, ever....blink. Step 9: Give the photo card to the artistic director so that she can tackle the monumental task of choosing the right shot and making a photo collage that fits perfectly on a printable 4x6 card and includes any missing family members (that step only applies to families scattered among several states/countries). 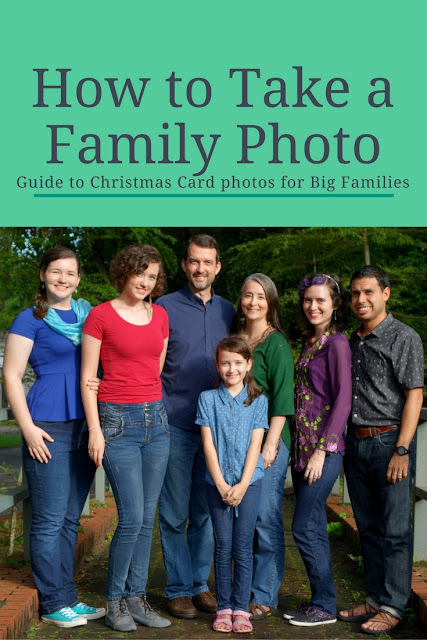 Have you taken a family photo this year? Although I love the finished product, photo 2 is my favorite - rock it Sarah! I love all of these photos! The fun poses are really cool. Your top looks awesome, btw. My mother-in-law has her own photography business and is really into taking photos, so she's already told us to plan on having a family photo shoot when we visit them for Christmas. I think it will involve 6 adults, 2 little kids, and one baby, so hopefully it won't be too difficult to manage, but I'm sure it will be an adventure! Cool photos! Sounds like fun! Love it! I have a big family and it is nigh-on impossible to get a group shot everyone is happy with! Family photos can be so much fun. Especially looking at all the bloopers we you're finished. Rachel, these pictures are perfect! I can feel all your personalities coming right out of my computer screen! Can you come to the states and play artistic director for a photo shoot of my family?? That's so great! I honestly can't remember the last time we purposefully took a family photo. I mean, we took a lot of pictures when we were all together at Christmas, but it was totally a tripod affair. We'll have to try this sometime very soon. Haha I love this! :) Y'all did awesome!! AaH, these are lovely! We try an arrange family photo's every year! It's such a wonderful way to honor the family! Thanks for sharing. What a fun post! I think family photos should be fun and reflect the members of the family like yours do! I laughed out loud reading this post! This is awesome - love all the pics! What a wonderful and beautiful family! I loved this! Great photos! Looks like you all had a lot of fun! Haha! I love this! We had to wait for my mom to visit to have a free photographer. Most of the pictures are a bit blurry, but I don't care even a little. This is awesome! We need to get family pictures done soon. I love these tips! We haven't taken one yet, but we will all be together next weekend, so I have a feeling the cameras will be coming out! I will keep these tips in mind! My favorite is the one with everyone's arms folded! Even if you don't use it for a Christmas card, you should definitely use it for a caption contest! haha, I love this! I recently got a fancy-schmancy camera (I've been wanting one for the past 10 years so I decided it was finally time to treat yo' (my)self! 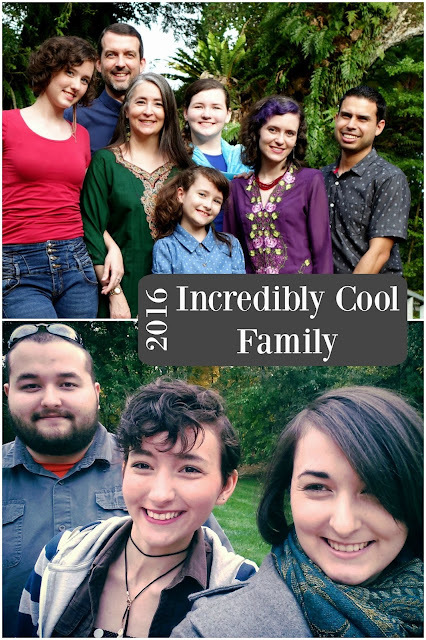 My family hasn't all been in one place for the past decade (mostly because of me), so I really need to get on this! And yes, I shall remember to never ever blink and to keep smiling even after the smile gets fake! Your photos look so fun!